Monday: Wake up. Uh-oh. What’s this? A cold? I HAVE A COLD? WOE IS ME. Oh, wait. I’m not a man. Proceed with day. Tuesday: Wake up twenty seconds later than usual due to cold. Notice Husbandrinka having breakfast with the kids. Notice that Young Ladrinka is sitting next to a tube of Benadryl Cream. Turns out that Young Ladrinka is covered with hives. Take Young Ladrinka to the pediatrician who confirms that Young Ladrinka is covered with hives. Tragically, they are contagious and despite Young Ladrinka’s protestations that he doesn’t want his class mates to “catch the itch” and go through the hell that he’s been going through, he’s Claritined and dispatched to school. Marinka: still sniffly. See, Monday. Cold. Wednesday: Wake up. Thank the Good Lord in Heaven that Beautiful Daughter’s High School Applications are not due until December 1st. A whole month to work on them together by the cozy fireplace! Thursday: Wake up. Coldless. See that Kristine’s son reviewed Wanted:Cat. Automatically place Kristine & Son on Preferred Blogger list and demote everyone whose child has not reviewed Wanted:Cat to a different list. Not necessary worse list. Just different. Oh yeah, high school applications. Send Beautiful Daughter a text reminder. Friday: Wake up. What? A Wanted: Cat review and giveaway?! Stasha and her son are now on the Preferred Blogger list and Kristine and her son, well, they’re on a different Preferred Blogger list. Thank you, ladies for giving birth to such wonderful boys with great taste in literature! So. How was your week? Did you wake up? 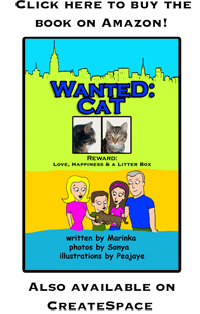 I’ve been so, so excited about Wanted Cat, the website and Wanted: Cat our inter-species children’s book! And very grateful for all the support it received from my friends and fellow patriots Wendi and Anna and Stasha and Shari,and Barbara, who doesn’t have a blog, and who has been so supportive and you, what are you waiting for exactly, an invitation?! It basically goes without saying that if you love America and children, you should get a copy of Wanted: Cat. Although the book appears to have an unintended effect of having children want to get a cat. But that’s better than children begging for heroin or video games, right?! Still not convinced? Let me help you. Wanted: Cat– Only $9.95, absolutely legal and gets your child addicted to reading! Wanted: Cat– Numerous studies link childhood reading with being able to take care of aging parents in comfort and style later on in life, quiet as a mouse reading time, only $9.95. Is the choice not clear? Do you not love your children? If you would like a copy of the Wanted: Cat, but cannot afford it, or would like to donate it to your Public Library or school, please contact me at MarinkaNYC@Gmail.com and I’ll do my best.